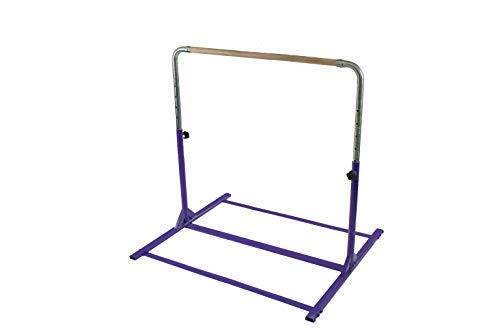 Children Kids Jungle Monkey Bar Gymnastics Athletic Expandable Kip Balance Bars Junior Training play Gym PURPLE with 2Ft x 6Ft x 2" Gymnastic Mat great for Children between 3 to 9 Years old. made of kids safe long lasting strong Steel, can support up to 130 Lbs. 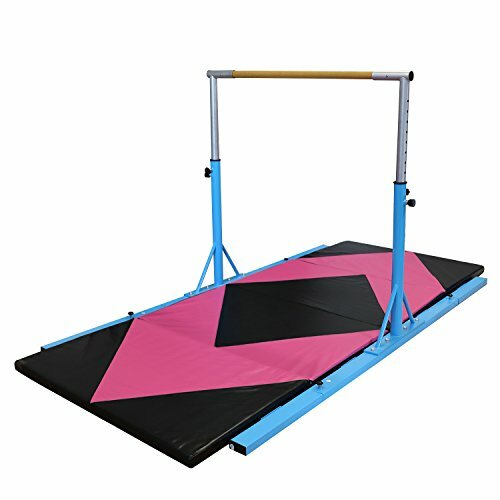 The Floor Bar can be used in many creative ways with other Tumbl Trak products where bounce to Handstand drills can be practiced. The metal base of Tumbl Trak's Floor Bar has Velcro on the bottom to allow for easy attachment to carpet. Practicing control of the handstand, which is probably the most essential skill in gymnastics, is less stressful on athletes wrists when using our 4 long floor bar. 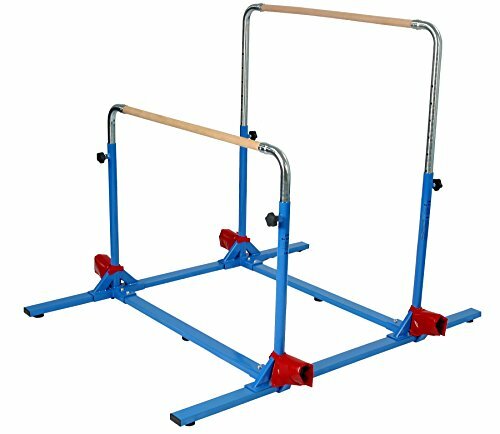 Tumbl Trak s Forster Bar is a training aide intended to help perfect shifting for bar skills such as clear hips. The octagonal ends allow gymnasts to practice skills, such as a straight-arm backward roll. 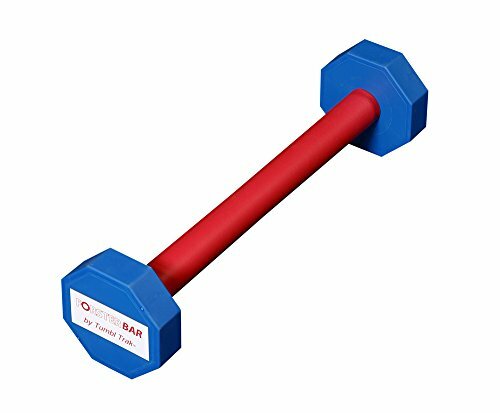 A rubber coating covers the bar, and gives a good grip, making the bar a safer training device. Developed with Coach Tom Forster, the Forster Bar is an inexpensive, useful training aide that every gym should have. Brand new! professionally made for the best quality! the quality of the bar is superb and is made to last. This 3-Play is designed to change from the adjustable horizontal bar to the adjustable uneven bars and to the adjustable parallel bars. Base extensions (value $100) included for stability. The height of each bar will adjust from 3 feet to 5 feet every 6 inches - 36, 42, 48, 54, 60 inches. The width will adjust from 18 inches to 36 inches every 3 inches - 18, 21, 24, 27, 30, 33, and 36 inches. The 1-1/2 inch wood dowels and base are 4 feet wide and will fit any normal 4 feet wide gym mat. Made with heavy duty steel powder coated blue. The bars weight limit is 125 pounds. Design includes rubber caps on the bottom frame for traction and lock knobs for simple adjusting. A professional gymnastics mat should be used with this product to help reduce the chance of injury. We also make and sell gym mats to place in the center for additional safety. 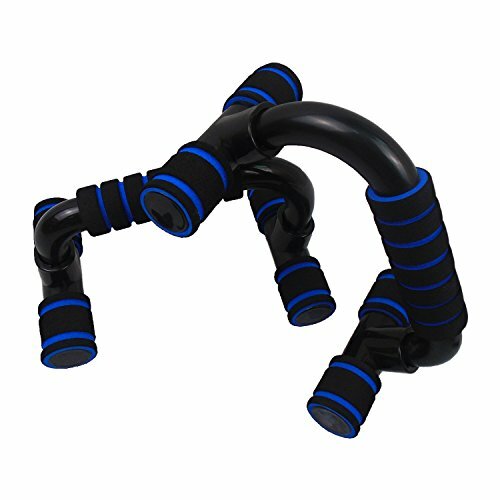 3-Play is designed to change from the adjustable horizontal bar to the adjustable uneven bars and to the adjustable parallel bars. The height of each bar will adjust from 3 feet to 5 feet every 6 inches - 36, 42, 48, 54, 60 inches. The width will adjust from 18 inches to 36 inches every 3 inches - 18, 21, 24, 27, 30, 33, and 36 inches. Made with heavy duty steel, powder coated blue. The bars weight limit is 125 pounds. 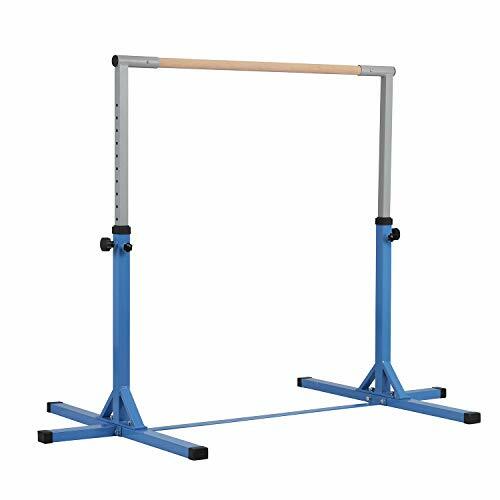 Nimble Sports 3-Play is designed to change from the adjustable horizontal bar to the adjustable uneven bars and to the adjustable parallel bars. The height of each bar will adjust to 36, 42, 48, 54, and 60 inches. The distance between bars will adjust to 18, 21, 24, 27, 30, 33, and 36 inches. The bars are fitted with 1-1/2 inch wood dowels. Made with heavy duty steel powder coated blue. The bars weight limit is 125 pounds. Design includes rubber caps on the bottom frame for traction and lock knobs for simple adjusting. A professional gymnastics mat should be used with this product to help reduce the chance of injury. The folding mat will fold down to (4) 2 feet X 4 feet sections to allow easy transport and storage. Mat is made with 1-3/8 inch thick cross link firm foam enclosed in a durable 18 ounce vinyl coated nylon cover. The mat is fire retardant, mildew and puncture resistant. Velcro strips on each end allows you to connect additional mats for more tumbling fun. The height of each bar will adjust to 36, 42, 48, 54, and 60 inches. The distance between bars will adjust to 18, 21, 24, 27, 30, 33, and 36 inches. Mat is made with 1-3/8 inch thick cross link firm foam enclosed in a durable 18 ounce vinyl coated nylon cover. Velcro strips on each end allows you to connect additional mats for more tumbling fun. Single Bar, Double Bar, Mini-unevens, Parallel Bars or Wall Station, the 5-in-1 Bar System is big in ideas and uses for its small footprint. This bar is stable enough for various swinging, hanging and strength skills. When used as a Wall Station, the Bar System allows for several learners to be engaged at one time. 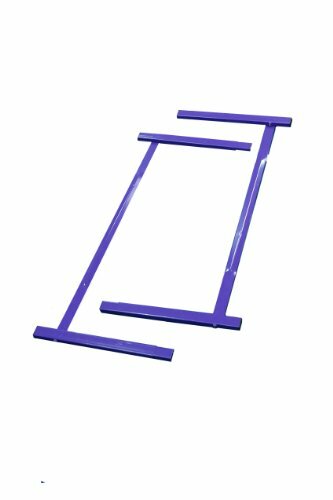 The 5-1 Gymnastics Training bar is an extremely versatile piece of gymnastics equipment that can be used in many different settings. 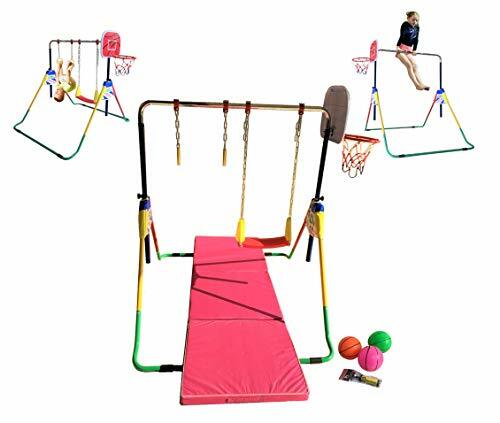 Each bar is adjustable from 38 to 59 and is stable enough for various swinging, hanging and strength skills. 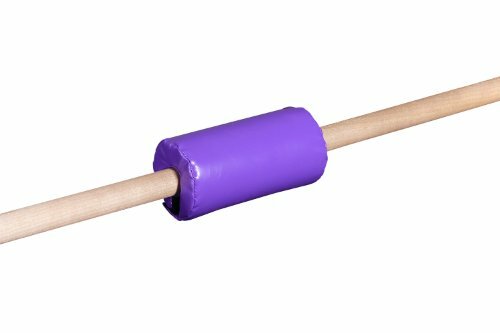 The Bar Pad is 9.5 inch long and wraps around a 1.5 inch in diameter bar to offer padding for a gymnast learning new skills. It is Used to create a live workout scenario. WE KNOW GYMNASTICS - When you purchase a product from Tumbl Trak, you know that you're getting a TRUE gymnastics product. Coaches, former gymnasts, and industry experts make up the our staff ensuring you get the best product for your athlete. Heavy duty, portable, stable, free standing, and no need to bolt into the ground Bars cover 54" x 48" of floor space. The Sturdy Steel will withstand almost 150 pounds of direct weight. Other bars may have the same dimensions but our bar's construction makes it much more robust and stable. Height: Adjustable from 35" - 51"
Assembled Dimensions: 58.5" x 42.5" x 54"
Durability - This bar is made of heavy steel gauge, and so extended quality service is guaranteed. 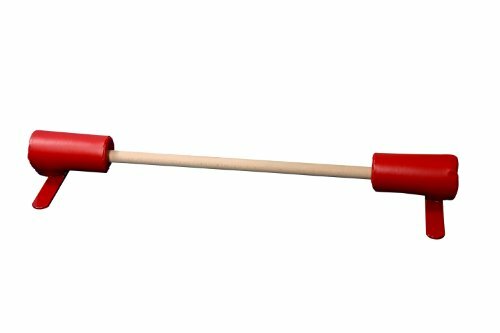 Safety - The gymnastic bar is embedded with rubber and caps to avoid sliding and destroying the floor surface. 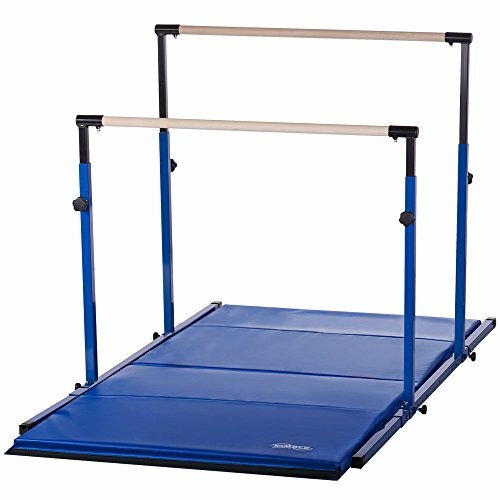 Are You Looking for the Gymnastics Bar for your child? The triangular structure is perfect design for gymnastic bar to improve stability. 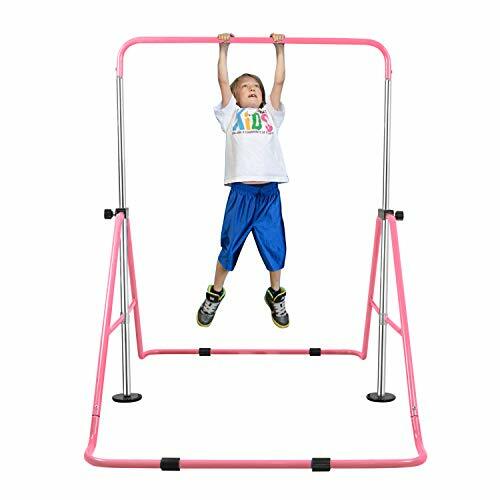 Having this gymnastic bar at home will tremendously increase your child's skills bar skills, like kipping, swing, strength building and so on. EASY TO ASSEMBLY The gymnastics bars for home comes with easy to understand instructions and is quickly assembled. Simply follow a few steps and you're ready to go. STURDY AND SAFE Have peace of mind the bar will stay in place and not move. 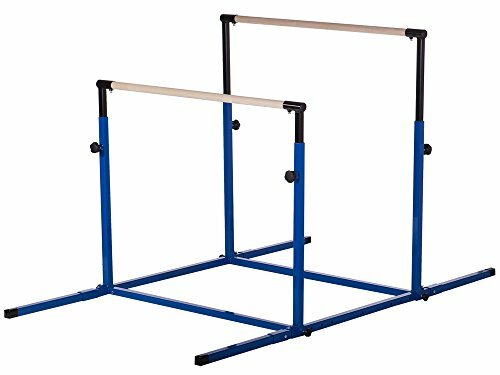 This multi-function integrated training device the size is 58 x 40 x 54 (Inches);Great bar for gymnasts from level 1-4 under 140lbs. EXPANDABLE & FOLDING The gymnastics bar can be easily adjusted up or down in height, can be folded to save space, the gymnastic training bar have 4 height to adjust: 34.8/40.5/45.5/51; Ideal for gymnasts from levels 1-4. It's a perfect gift for Birthday, Halloween, Thanksgiving Day, Christmas and so on. WHY CHOOSE YEEGO? Money back guarantee!!! Purchase from us, no pressure purchase because we offer 30 days free replacement and refund of any product quality problems within 3 years warranty. Any questions please feel free to contact us without any hesitations, we will reply you within 24 hours. ADJUSTABLE: The gymnastics bar can go as low as 35.5 and as high as 58.5 with 11 intervals in between.A 1-1/2in solid wood bar is tough enough to withstand the rigorous training. EASY TO SET UP: Assembly is simple with clear instructions and tools included.Whatever problems you have,you can contact Doitpower and help you out. HIGH QUALITY:Steel construction with a smooth, tough powder coated finish will keep your bar looking like new and functional for years to come.Other bars may have the same dimensions, but our bar's construction makes it much more robust and stable. High quality ABS material made, durable for usage. Gymnastics sticks to make the dancers perform better. Perfect for gymnasts,gymnastics fans and dance lovers,etc. 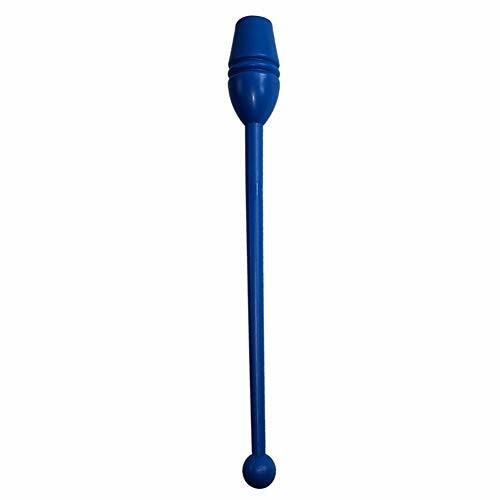 The 35cm long gymnastic bar is for child, the 45cm long gymnastic bar is for Adult. Package included: Only 1 pc Stick. Sportly Incline Pushup Bars are one piece of home gym equipment that no one should be without. The industrial grade PVC is strong yet lightweight, making them ideal for personal trainers and fitness fanatics who are always on the go. Use them indoors or out, take them with you to the gym or while traveling to isolate various muscle groups and ensure perfect pushups every time. The thick foam padding will protect your hands and prevent slipping, while the bars will make doing pushups easier on your wrists. Changing direction and spacing of handles will give you a complete upper body workout without having to worry about moving parts that can freeze up, wear down, or increase your chances of injury. Christmas Eve Gift for child to start their exercise for better body shape! Heavy Duty Material and Locking Mechanism Ensures kip Bar's Safety and Security.